Boxtop image received from Armory. Final version might be different. 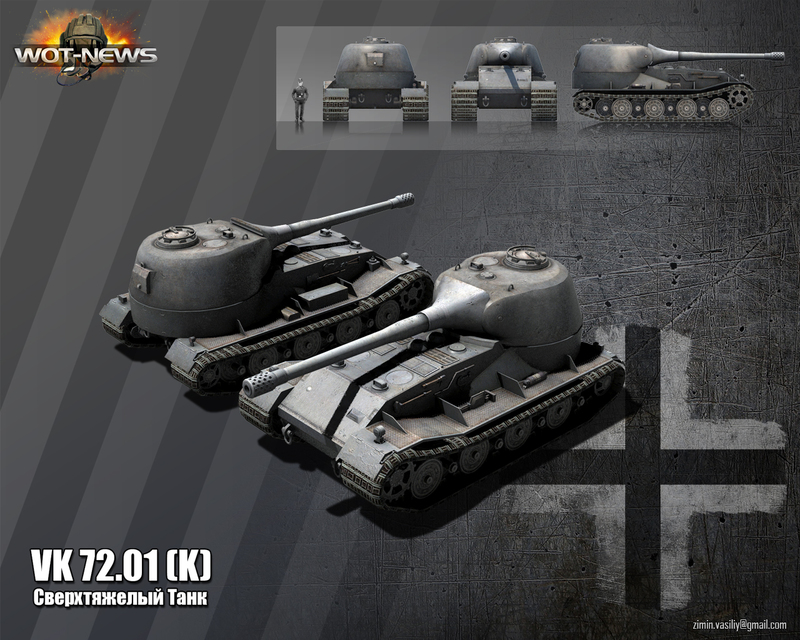 In mid-2013 WarGaming's World of Tanks (WoT) video game debuted this vehicle as a special end-game reward, touting it as "A rear-turreted, 100 ton Löwe design." Immediately suspicions arose about the historical accuracy of such a design. 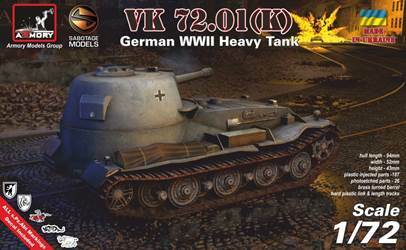 WarGaming defended it as coming from Walter J. Spielberger, a historian specializing in German World War II vehicles, and more in particular hsis book "Spezial-Panzer-Fahrzeuge des deutschen Heeres". 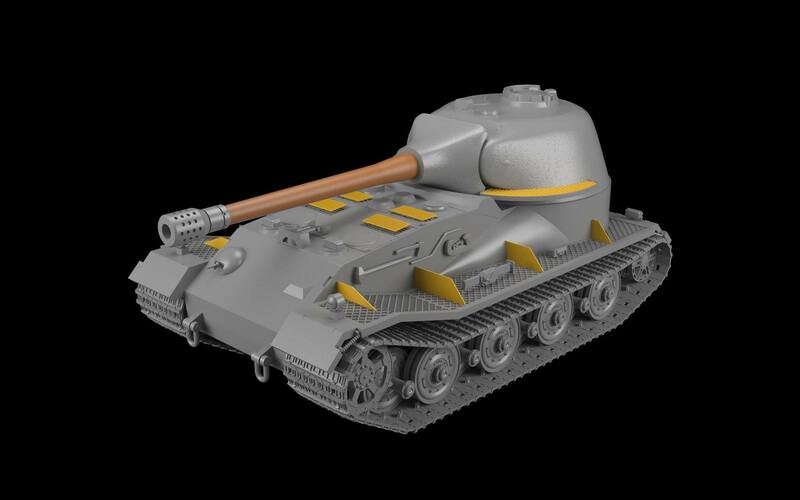 To summarize, the tank can perhaps best be described as a model of WoT's fictional rear-turreted version of the VK72.01 Löwe. The latter, incidentally, is far better documented, even though it also remained a paper Panzer. 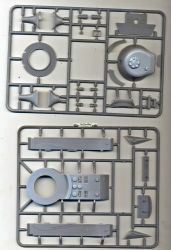 The preview sample that was sent to us arrived before the official release of the kit and while the sprues are the production items, they came without a box or instructions. 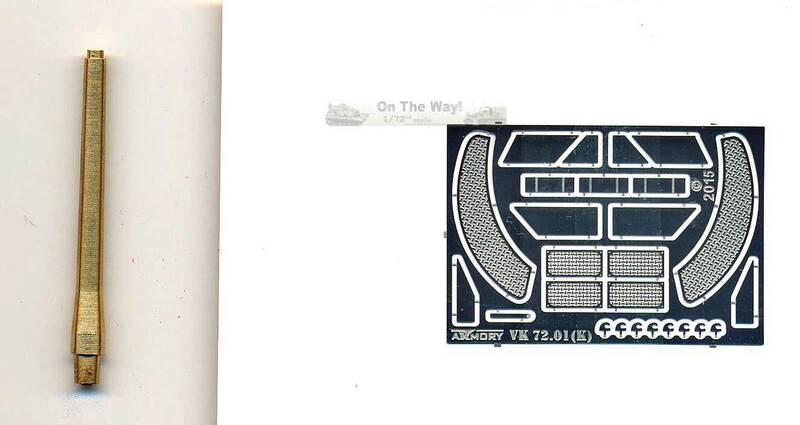 The following CAD drawings (received from Armory) were used as a guide instead. 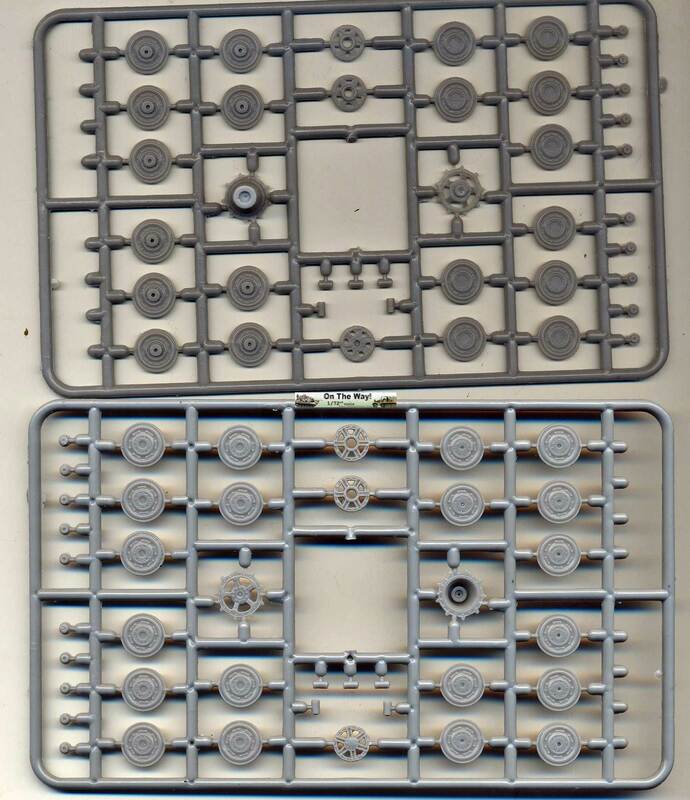 Two sprues with the running gear. 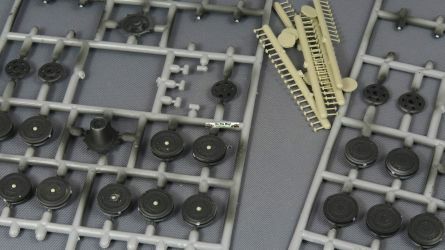 Detail is a bit softer here than on the other sprues and there is more flash, which has to be carefully removed while keeping a perfect round shapes of the wheels. 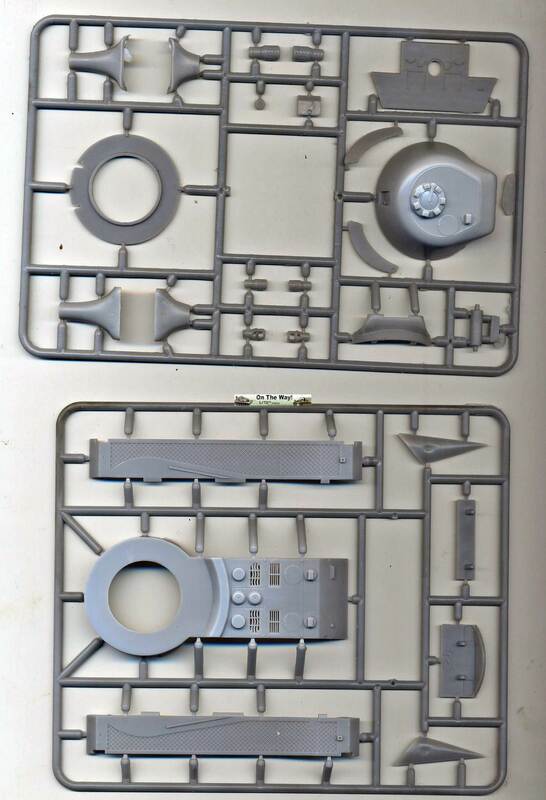 Of all the sprues this one feels most like a "short-run kit", even though mainstream manufacturers like Hasegawa offer a similar quality of running gear in their Panther kits, for instance. Tracks and lower hull. The link and length tracks are well done, although I would have expected a tank of this size to have had larger guide teeth. As the vehicle was never built, it is difficult to judge, though. The lower hull is well done, again reminding me of Hasegawa. Upper hull and turret. 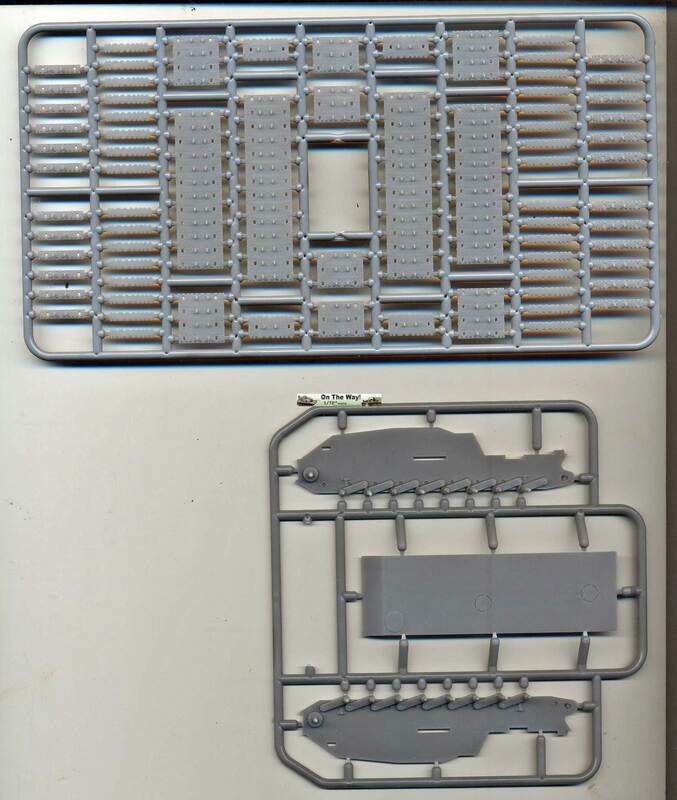 These two sprues are the crispest of all sprues, although they are also the ones where the striations that can be found on most sprues are the most obvious. They remind me of the (by now) typical striations of a 3D printed kit and will require a little bit of careful sanding to disappear. 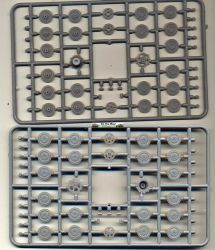 The two triangular parts on the corner of that sprue have sink marks (unless they were part of the original design, although I doubt that). 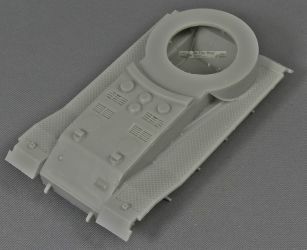 Comparing with the pictures of the VK72.01 Löwe, the engine deck of this kit does not have the casting imperfections of the front-turreted kit. 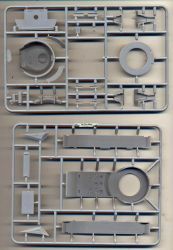 On the turret sprue, three muzzle brakes and two mantlets are given. 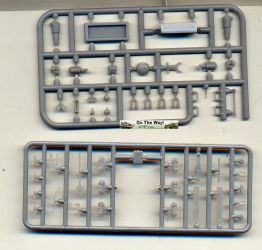 Sprues with small parts: tools, tow shackles, .... These are also crisply molded. Metal barrel and PE. Both very well done, although we still need to fit a plastic muzzle on the barrel. 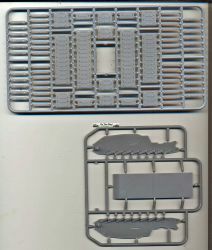 The decal sheet is substantial with artwork that seems based on Tiger units. 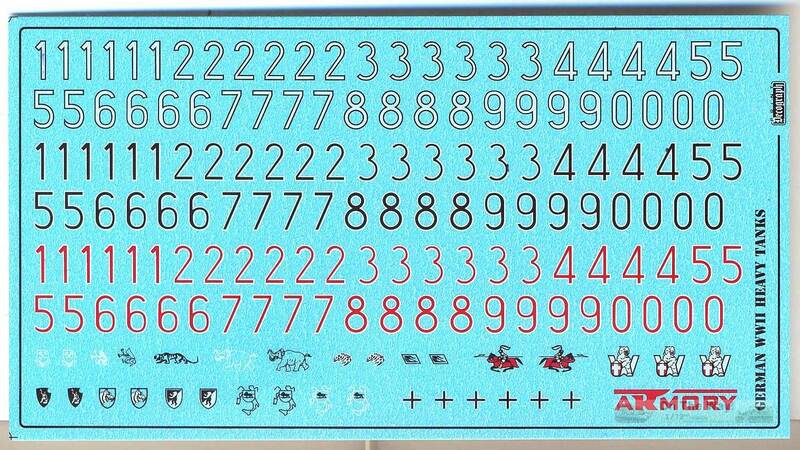 Only a tiny fraction of the decals will be required to finish the model. 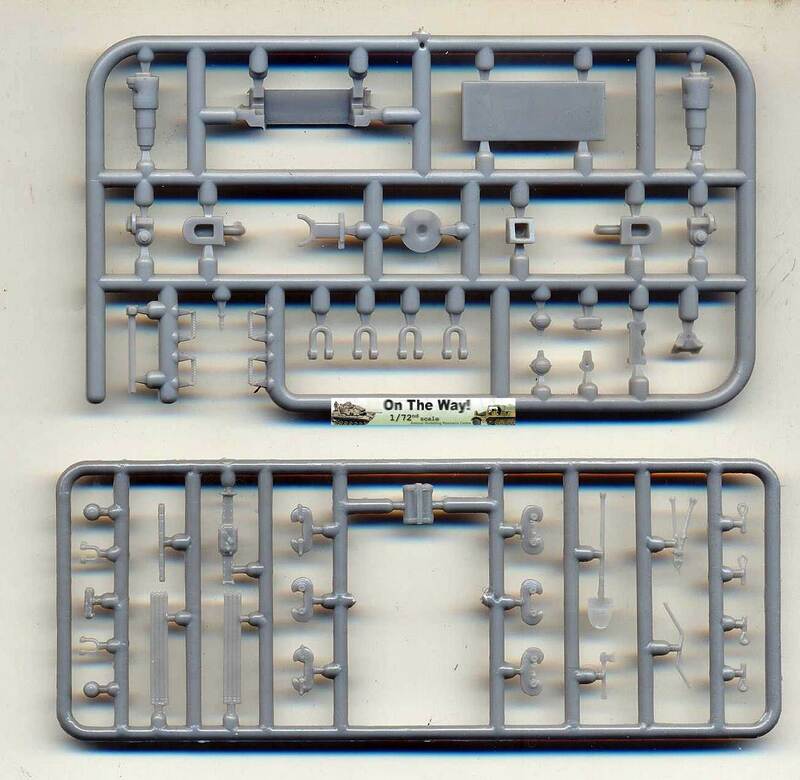 The decals are almost in perfect register, with just a very slight misalignment seen on the Balkenkreuze. 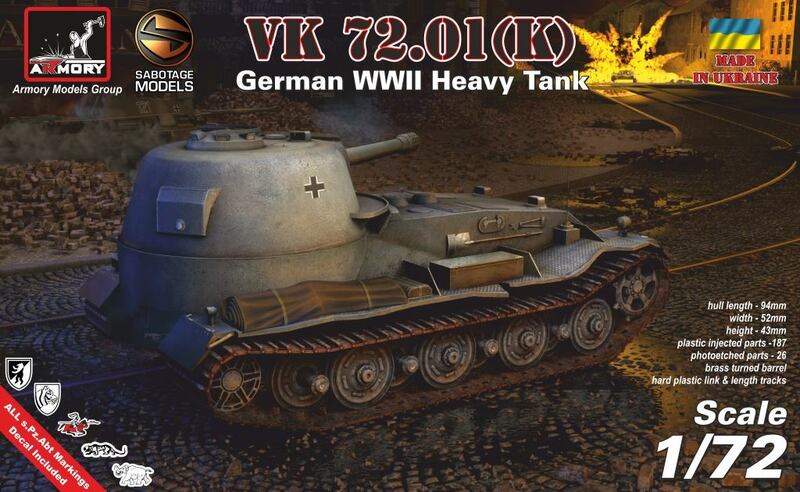 The latter appear quite small for a tank this size, by the way, but until historical pictures of the tank surface, no-one can say this is not correct. 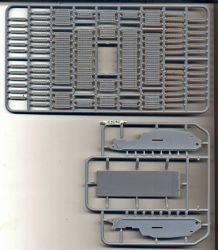 The first thing that struck me is that the plastic is quite hard reminding me of... Did I already mention Hasegawa ? The hull went together nicely, even though (lacking instructions) I wasn't quite sure in which direction I needed to fit the lower glacis. It seems both ways fit equally well. 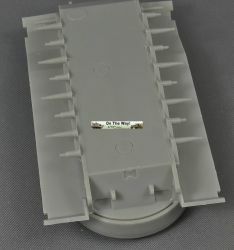 After assembling the hull, there is a gap under the rear of the hull that needs filling. I also added a bit of detail to the nose by engraving an interlocking pattern of the armor plates and roughened up the flat armor plates a little to create something of a "cast" texture (and to better hide the striations). A slit was scribed into the driver's visor, as well as a pane line around it. 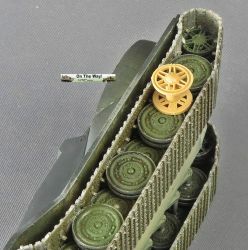 The most difficult part of the construction process of the hull were the round deflectors that go in front of the turret ring. These didn't fit very well and some puttying and sanding was required. To attach the fenders to the hull, I had to trim the tabs a little, and this is a constant feature of the kit: almost all the tabs are very slightly too large to fit the holes in the kit. 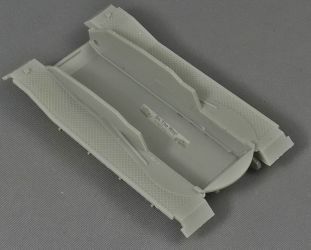 The fenders were thinned down at the edges, more prominent hinges for the mudflaps were made from stretched sprue and small springs were added from copper wire between the fixed part of the fender and the movable flaps. 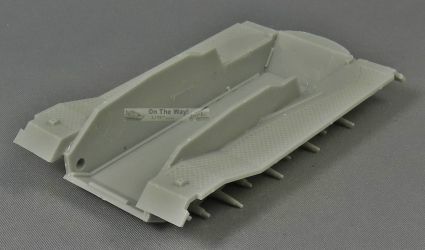 After adding the running gear (see below), I noted that the inside of the mudflaps (that attach to the hull) got in the way of the tracks, so I had to remove them belatedly. The rear mudflap was also uncomfortably close to the idler, so I ended up replacing it with some plasticard. The fender supports are in PE, but need to be filed into shape where they meet the curved deflectors. They also have the tendency to sit on top of the fenders (which is partly due to thread pattern being continuous). 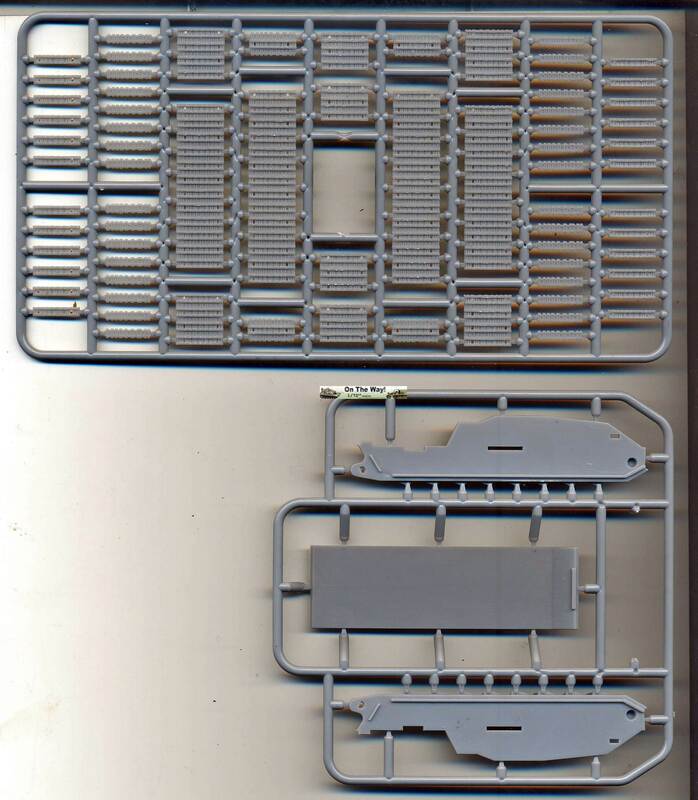 After some trial end error, I ended up carving slits into the mating surfaces of the hull and fenders, something (I believe) the kit should have provided in the first place, and which the modeler would better do before installing the fenders and adding all the tools. Identifying the exact location of these supports is also difficult, but this problem is mitigated by the what-if character of the kit. The turret ring is slightly too large for the opening in the hull, requiring some sanding. 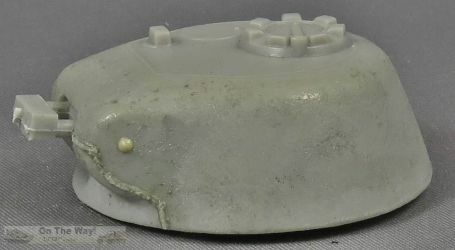 As the turret lacks any retaining pegs, the turret just sits on top of the hull, but with the weight of the metal gun barrel, the turret will just nose over. 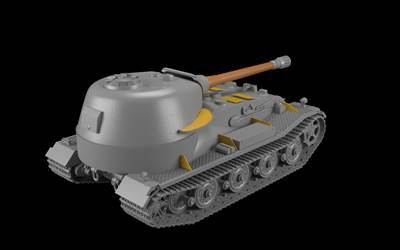 The modeler can either glue the turret firmly to the hull, or add a peg to the turret ring (like I did). 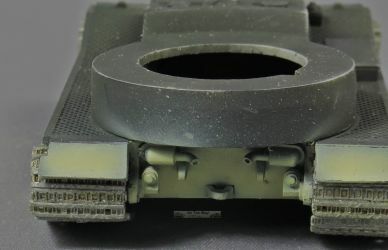 The lower front of the turret fits the rest of the turret rather badly. Some puttying and sanding was needed, and to make my life easier I added a prominent weld seem between the two parts and added a rough texture to the turret. 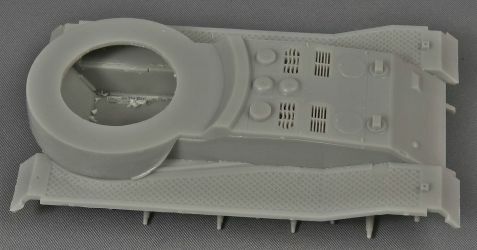 Furthermore, lifting hooks were added to the turret roof. The turret hatches are all closed, which I decided to live with, but I added a turret ring and an MG. 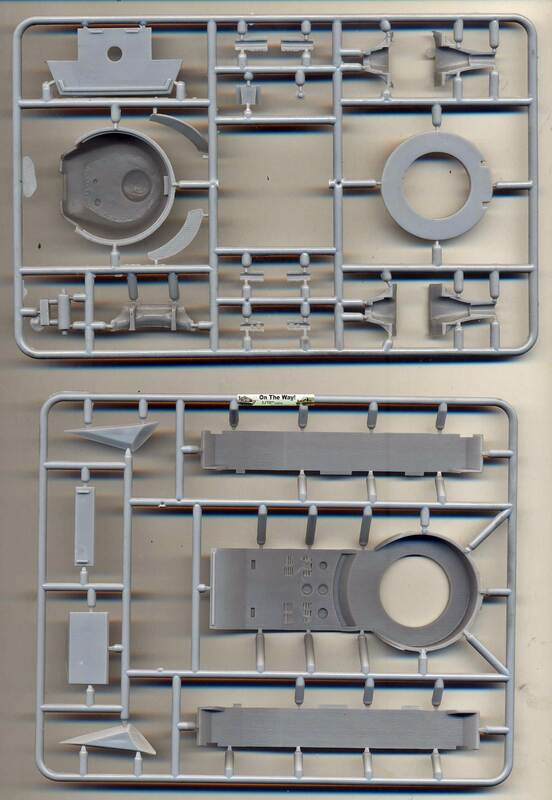 The latter is actually an MG3 from a Revell (post-war) Luchs 8-wheeler. The recess for the rear turret hatch needed to be enlarged a bit to make the hatch fit. I didn't personally like the "Dumbo ears" too much, which I think are only there to give the crew a way to get into the turret. I reasoned that the first prototypes might have been built without them, resulting in complaints from the crews, in which case makeshift field expedients would probably have been found. I added ladders to the rear of the hull and turret to create this effect. As the kit comes with a fair number of spare wheels, I put two pairs on the rear of the turret, Pz. Regt. I./24 style. The running gear was the biggest challenge. Fitting the tracks was a time-consuming affair. The individual tracks have either pegs or notches, but these don't match and this results in assembled tracks that look very different (i.e. spaced more widely) from the lengths of tracks that are provided. They will not fit the drive sprocket either. There seemed to be no other solution than to carefully sand the connecting links (the one without teeth) until they fit. Lacking instructions I managed to install the tracks incorrectly around the idler, which resulted in an idler that sat too close to the hull (requiring modification of the axle stub) and with tracks that stuck out beyond the idler in an unrealistic manner. 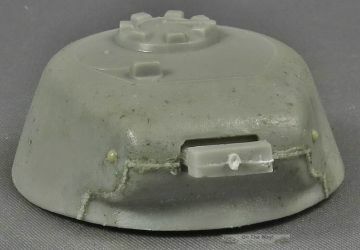 Fortunately the idler seems to be identical to that of the Tiger Ausf.B and my spares box contained a spare idler of that vehicle. A fourth idler wheel was added to get a more realistic appearance. As mentioned before, the tracks interfere with the inner side of the mudflaps, requiring some cutting and have little clearance with respect to the rear mudflap. Something that struck me is that the tracks are wider than the fenders. I cannot claim that this is inaccurate, but it looks strange, that's all. 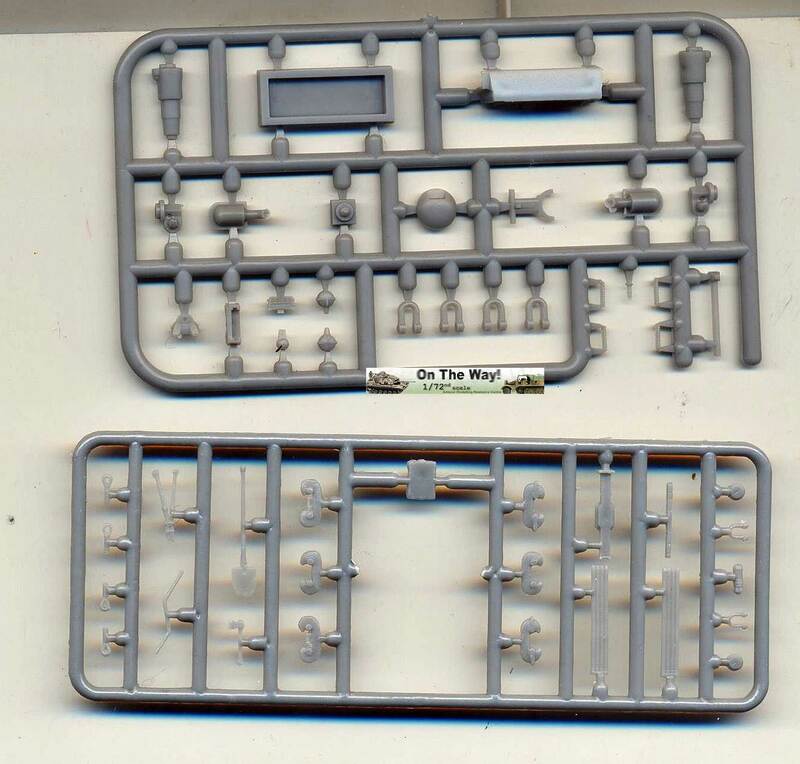 The tools are rather poor in my opinion and the hammer that could be seen in the CAD drawings was not found on the sprues. I replaced all the tools with items from the spares box. Clamps were made from metal sheet. The lay-out that I chose differed from the boxtop and CAD drawings. 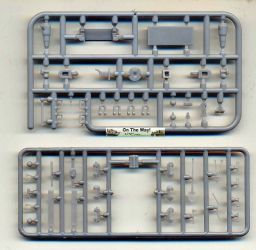 A section of spare tracks was added to the bow, held in place with a rack found in my spares box. An antenna was added from metal rod. 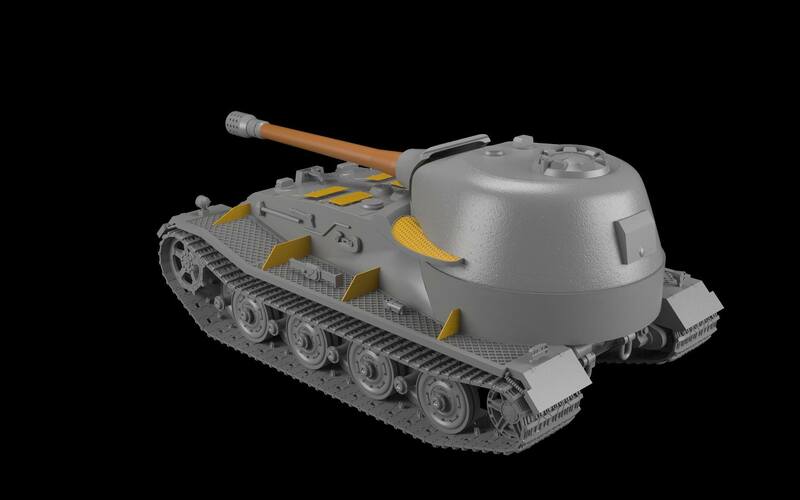 As mentioned earlier, I replaced the "Dumbo ears" with ladders and added an MG and spare wheels on the turret. 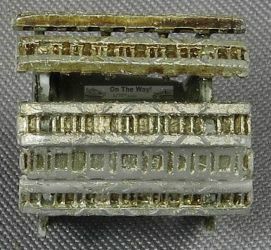 The hull MG was made from hollow brass tubing. Note that the tarp that is shown on the boxtop is not included. 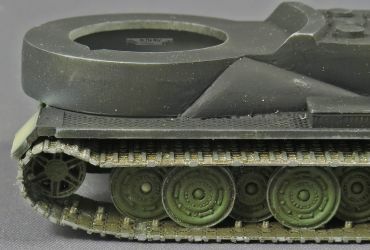 I chose to paint the tank in a classical late-war three-color camouflage and used a selection of kit decals, except for the Balkenkreuze which seemed rather tiny for a tank of this size. 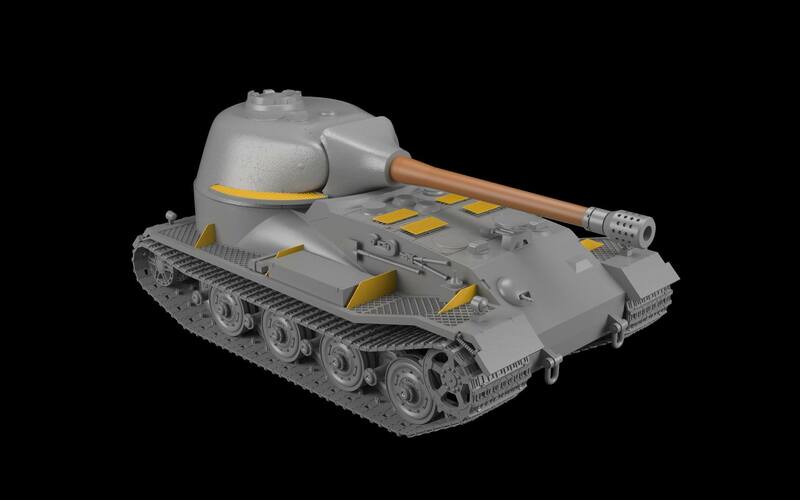 The latter were replaced with those from a Dragon Maus. 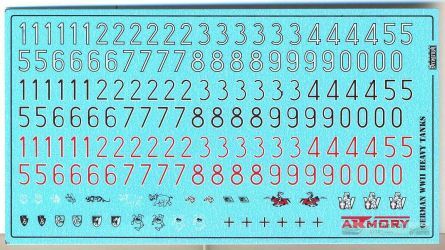 The kit decals went on very well, without any issues whatsoever. Preview sample kindly provided by Armory.